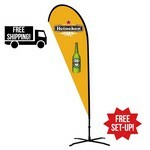 Promotion Pros is the best place online to buy custom floor displays to advertise your business. 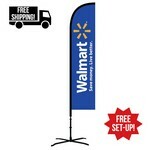 We are stocked with double-sided, single-sided and indoor or outdoor flag floor displays, so no matter what you're searching for in a floor display, you'll find something that fits the bill. Floor displays help announce your business at trade shows and conferences, letting visitors know who you are and what you're about. Our personalized floor displays will attract people to your booth or table at business expos, and can bring customers to your store when placed on a sidewalk outside. 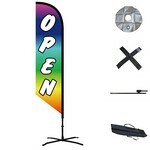 With styles ranging from teardrop and feather, retractable banners, and in small, medium and large, our custom flag displays use color, your company name and logo to promote brand recognition. 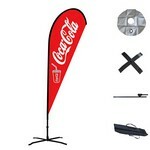 At Promotion Pros, we offer quality promotional products with your custom logo at affordable prices. 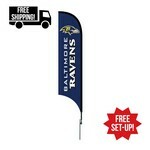 Shop for customizable Double Sided Straight Feather Banner Flags and get your booth noticed. 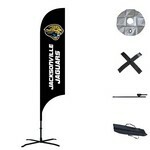 Custom Promotional Flags are an eye-catching way to market your brand. 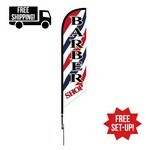 Shop for customizable Double Sided Teardrop Feather Banner Flags and get your booth noticed. 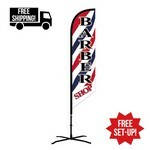 Custom Promotional Flags are an eye-catching way to market your brand. 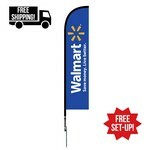 Shop for customizable Single Sided Angled Feather Banner Flags and get your booth noticed. 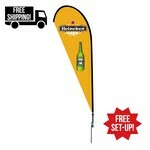 Custom Promotional Flags are an eye-catching way to market your brand. 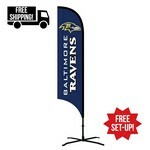 Shop for customizable Single Sided Concave Feather Banner Flags and get your booth noticed. 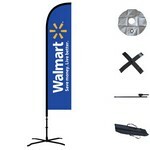 Custom Promotional Flags are an eye-catching way to market your brand.